A typical practice should include work on skill development, team play, and conditioning. For younger players (under 10 years old), the team should focus more on the basic skills of skating, passing, shooting, and puck control, with less emphasis on team systems. 1. Player 1 and player 2 skate toward the center circle, staying on their own sides of the center line. 1. The forward protects the puck for 15 seconds and then drives for the net and shoots. To begin, the coach shoots the puck into the corner. The five players for the power play team are on the blue line. The five players then break out using one of the following patterns. With over 40 years of coaching experience, author Dave Chambers presents 500 drills that have been put to the test and used for developing players at all levels of competition in North America and internationally. Drills improve players’ shooting, passing, goaltending, and skating skills and in-game strategy and decision making for power plays, penalty kills, face-offs, and breakouts. The primary audiences for the book are hockey players and coaches at all levels of competition. 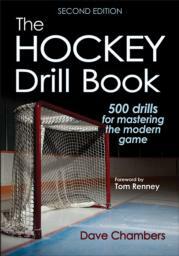 Additionally, public hockey rinks that offer skill sessions (stick and puck) to the general public will benefit from the drills featured in this resource. Dave Chambers has coached hockey for more than 40 years from key developmental levels to the National Hockey League and international competition. His experience with all types of players and styles makes him well suited for teaching the ever-evolving game that is a blend of the European and North American styles. Chambers has won two gold medals in World Championships, five university championships, and five Coach of the Year awards. He was named Master Coach by the Canadian Hockey Association and was inducted into the York University (Toronto, Canada) Sports Hall of Fame in 2006 and the University of British Columbia Sports Hall of Fame in 2001. Chambers was an assistant coach with NHL’s Minnesota North Stars and head coach of the Quebec Nordiques. He coached the Canadian national junior team to the gold medal at the World Junior Championship in Moscow in 1988, the Canadian team to the championship in the International Spengler Cup Tournament in Switzerland in 1987, and the Canadian student national team to the silver medal at the World Student Games in 1985. His university coaching career spanned 14 seasons while he earned a record of 334-110. Chambers coached at the University of Saskatchewan and the University of Guelph before holding the head coaching position at Ohio State University, where he won the CCHA Championship. He then coached at York University in Toronto, where his teams won three division championships, three Ontario championships, and a Canadian National Championship. Chambers holds a PhD in sport science and was director of the coaching program at York University in the School of Kinesiology and Health Science. Chambers has written books and articles on coaching ice hockey and has made numerous presentations worldwide. He lives in Collingwood, Ontario.